NASA has released a new report detailing all it knows about the unprecedented interstellar object caught passing through our Solar System late last year. ‘Oumuamua – the Hawaiian word meaning “visitor from afar arriving first” and pronounced oh-MOO-ah-MOO-ah – was first detected by a telescope at the University of Hawaii in October 2017 as it traveled through our Solar System, sparking excitement as some theorized this elongated object could be an alien spacecraft outfitted with a solar sail. Although an alien invasion would be the perfect way to round out 2018, that’s probably not the case. Shortly after ‘Oumuamua was first discovered, scientists pointed the Spitzer Space Telescope in its direction. Spitzer tracks comets with infrared energy and uses radiating heat to gather information about their size. However, the space-sailing object was too faint for the telescope to pick up even after the object was at its closest approach to earth last September. 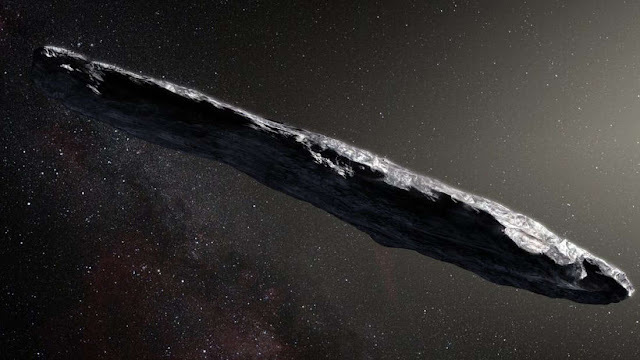 "'Oumuamua has been full of surprises from day one, so we were eager to see what Spitzer might show," said lead author David Trilling in a statement. "The fact that 'Oumuamua was too small for Spitzer to detect is actually a very valuable result." This “non-detection” makes ‘Oumuamua all the stranger. Because Spitzer wasn’t able to detect the object, scientists are able to put a size limit as to how big it can be, but not its shape. Astronomers have project three different sizes assuming ‘Oumuamua has a “spherical diameter,” about 440 meters (1,440 feet), 140 meters (460 feet), or as small as 100 meters (320 feet). That small size is consistent with a related study published earlier this year that observed the spacecraft may have vents on its surface capable of emitting gasses, acting like small thrusters to give it a slight boost and speed and direction. Writing in The Astronomical Journal, experts now say the asteroid may also be up to 10 times more reflective than comets currently residing in our Solar System. We can’t chalk that up to E.T. just yet. A comet’s reflectivity, or “albedo”, can change throughout its lifetime. When it passes close to the Sun, ice found on its surface can warm and turn to gas, which then sweeps dust and dirt off the surface to reveal more reflective ice. It’s probable 'Oumuamua went through such a deep clean when it made an extremely close approach to our Sun just over a month after it was first discovered. Unfortunately, there is still so much we don’t know about 'Oumuamua – and it’s likely we’ll never get the chance to learn more. The spacecraft is leaving our Solar System (we can’t totally blame it, tbh. Perhaps come back in say, two years?) and is well beyond the reach of any of our telescopes. "Usually, if we get a measurement from a comet that's kind of weird, we go back and measure it again until we understand what we're seeing," said Davide Farnocchia, of the Center for Near Earth Object Studies (CNEOS) at JPL and a co-author on both papers. "But this one is gone forever; we probably know as much about it as we're ever going to know." Yes, absolutely! I'm all for people coming here to better their lives. And the lives of their family. But we need to stop the free flow of people who can't seem to follow the laws regulating how you become a citizen. And that's not right, or fair for the rest of us! Build the wall. And do it NOW!